Cresson is a word, a word that was found, in fact, by a Lexicolatry reader on a Boggle board in Lexi's post on the word boggle. I emphasise that cresson is a word, because I did this before with said reader in said post, and got into trouble for patronisingly confirming its existence to someone that already knew it and had thus called it during this mini-Boggle challenge. 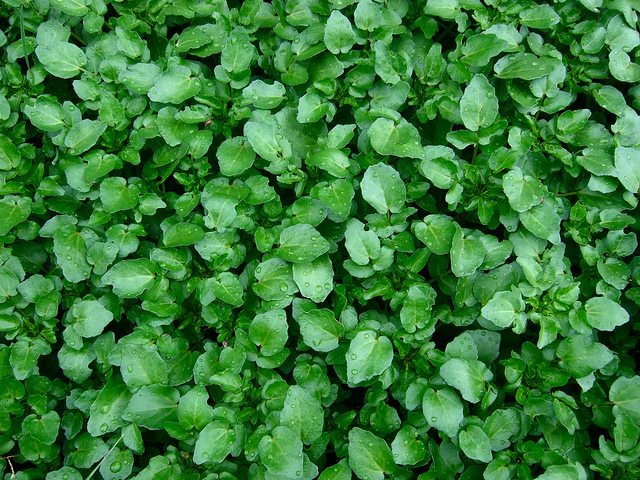 So it's there, in the OED, so next time you need to call green but neither green nor leafy green will suffice, consider cresson, the colour of watercress (which, to me, just looks green). Do please leave your most ecological comments in the vegetable box below. I'd just like to say well done to Wendell Smith for taking such a lovely photograph of Watercress. I mean, just look how much Watercress is in it. You just don't see that many good photos of Watercress these days. I don't think I've ever used the word Watercress so many times in my life. I think the 1950s is widely considered the Golden Age of watercress photography, so well done Wendell indeed. Crotch - Why Oh Y For Fork's Sake? What Is the Origin of 'To Come a Cropper'? Crone - What a Carrion! Crevasse & Crevice - What's the difference? Did 'Crap' Originate with Thomas Crapper? How Many Different Types of 'Coup' Are There? What Is a Countable Noun?